If I’ve learned nothing about science from writing articles such as these, it’s that whenever you find a study that suggests that something is bad for you, all you have to do is wait a few days and you’ll find another study that suggests that the same something is good for you. Take, for instance, caffeine. Just last week I wrote an article that covered research done on highly-caffeinated canned “energy drinks,” and how they have been linked to adverse effects ranging from convulsions to spontaneous abortions to heart attacks and deaths. That really didn’t make my day, because I happen to love coffee. I don’t drink all that much of it, but what little I do drink does have a tendency to make my day. After writing the energy drinks article, I toyed for a few minutes with switching to decaf. Silly me. All I had to do was wait. And sure enough, today I came across research from a number of different sources that suggests that there are quite possibly more benefits from drinking coffee than there are deleterious effects. For example, the results of one 22-year study conducted by the Harvard School of Public Health determined that “the overall balance of risks and benefits [of coffee consumption] are on the side of benefits.” In their study, men who drank several cups of coffee per day (6 or more) had 20% fewer incidences of colon cancer than those who didn’t drink coffee. Other studies have indicated that moderate coffee consumption leads to lower risks of heart disease, Alzheimer’s disease, Parkinson’s disease, Type 2 diabetes, cirrhosis of the liver, and gout. Now a report from Dr. Peter Martin of the Institute for Coffee Studies at Vanderbilt University suggests that you can drink as much of the bubbly black stuff as you want. If you caught that, you’re pretty sharp; the Institute is funded by a 6 million dollar grant from the Brazilian Coffee Association and other coffee-growing organizations. However, the director of the Institute claims that its researchers are very aware that this connection could be perceived as tainting their studies, so they go out of their way to stay at “arms length” from the coffee industry, and to have all of their research validated by independent scientific researchers before publishing. Adding to this recommendation, the findings on coffee providing some protection from Type 2 diabetes come from the Harvard School of Public Health’s Department of Nutrition, as published in the American Journal of Clinical Nutrition. Their research, conducted for 20 years and controlling for dietary and lifestyle risk factors, found that coffee drinking – regardless of how much consumed or caffeine content (regular vs. decaf) – was strongly linked with a decrease in Type 2 diabetes, resulting in an 8% decrease in women and a 4% to 7% decrease in men (depending on whether they drank regular coffee or decaf). The researchers point out that because these decreases were found after drinking either regular or decaf coffee, caffeine is clearly not the whole story. Coffee, as it turns out, is a great deal more than caffeine, which comprises less than 3% of its chemical makeup. The rest is made up of over 600 different chemical compounds, some of which are beneficial, and some of which are less so. For example, while caffeine in large quantities has been shown to be bad for most people, caffeine in small quantities has been proven to relieve headaches and to decrease depression. Two other chemical components of coffee – chlorogenic acid and caffeic acid – have been shown in clinical tests to reduce the formation of amyloid polypeptides that lead to Type 2 diabetes. Oils called diterpenoids present in unfiltered coffee have been shown to lower levels of “bad” cholesterol and raise levels of “good” cholesterol. And coffee is also full of antioxidants, which may help to prevent free oxygen radicals that cause cell damage. On the other hand, certain chemical components of coffee are known carcinogens in mice. But only when ingested by or injected into mice in quantities that a human could never achieve by drinking several cups of coffee a day. To finish up the evidence “for” drinking coffee, research published in the New England Journal of Medicine this year studied hundreds of thousands of adults and found that those who drank coffee lived longer than those who didn’t, and the more of it they drank, the longer they lived. So like almost everything else in the world of scientific research on health issues, there is no simple answer as to whether you should drink coffee or not. 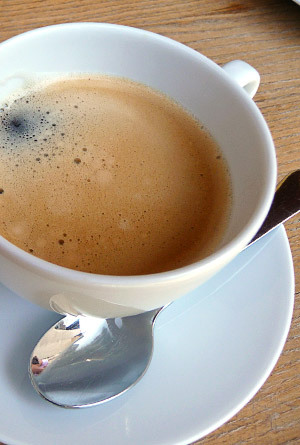 Doctors tend to agree on one thing – if you’re not already a coffee drinker, don’t start now. But for people who love coffee like myself, even though the research is often contradictory, I’m going to go with the scientists who tell me I can still enjoy my morning cuppa.